With any luck, in the coming years, the 1980s cult classic The Last Starfighter will make a comeback. Until then, we can live vicariously through this wonderful piece of art and hope for more like it. Artist Barry Blankenship created this super cool piece called “Starfighter Fields Forever” for his two-person show with Dave Quiggle at Gallery 1988 in Los Angeles, CA. It’s available in a regular edition, variant edition and, as of publication, an original drawing too. Here they are. The original pen and ink. We love this piece because it works on so many levels. 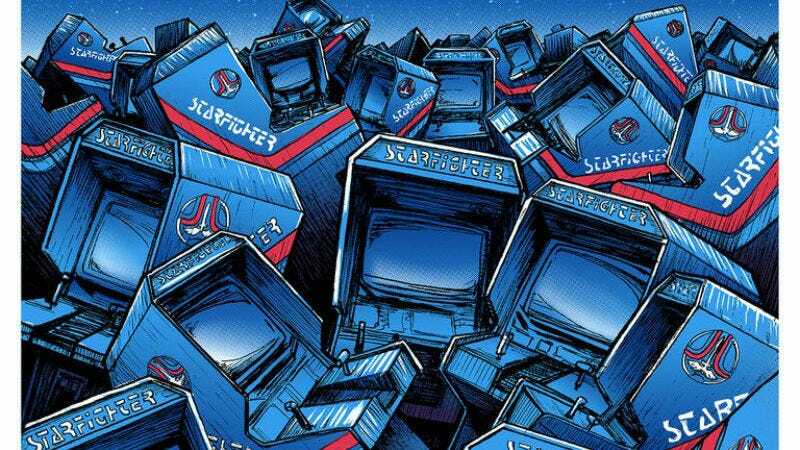 Obviously, first and foremost, it’s paying homage to The Last Starfighter by recreating and duplicating the the standup arcade machine at the center of the film. It’s also an acknowledgement of a time long gone, when those machines were part of our popular culture. The title of the pieces is, of course, a nod to the Beatles—and the Starfighter in the sky feels like a wink to Galaga and Space Invaders. Anyway, it’s an awesome piece, and if you want to pick it up make sure you also check out the full show at this link. There are also pieces inspired by The Monster Squad, Contact, Stranger Things, Ghostbusters, and more.